Having leveled the playing field to give everyone an opportunity to turn their thoughts into moving pictures whether they’re screenwriting with Final Draft or editing with Final Cut Studio , today the computer is just another requisite piece of vital equipment that’s often taken for granted in the making of a movie. Yet as common as it is now to use a computer in the execution of everything from a low budget independent film or a multimillion dollar blockbuster, back in 1982 the groundbreaking use of CGI in Walt Disney’s Tron proved so daring that it took Oscar voters fourteen years to process just what exactly the filmmakers had achieved with an overdue award. 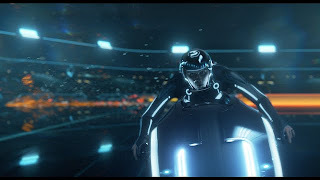 Contrary to the Academy’s original belief that computer effects constituted “cheating,” by blending together the fields of traditional animation, classic live action filmmaking along with the emergence of video and computer games, Tron created a perfect storm of cinematic possibility and inspired a brave new world of technological experimentation on film. Yet while there’s no underestimating the impact that Disney's cult classic had as a watershed work in opening the floodgates for the sea of CGI that followed, in terms of its overall plot, Tron left much to be desired. Reminiscent of a video game transferred to the big screen, because technology takes center stage, Tron's greatest strength becomes its greatest weakness. 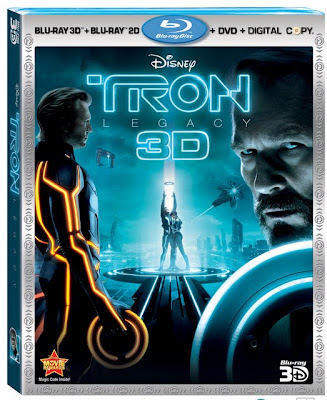 Once the film's heroic computer programmer Kevin Flynn (Jeff Bridges) is literally transported into the game he’d designed before his evil ex-employer stole it away, Tron leaves all plot, character and logic by the wayside, evolving into one long Gamer’s Odyssey. Essentially it's a cross between a video game head trip and post-punk Science Fiction complete with religious allegory that’s far more apparent in the sequel. 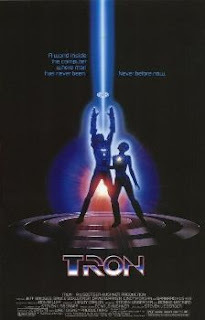 Though Tron will decidedly play best to its niche bracket of nostalgic Gen Xers and ‘80s babies, even then it’s still not as entertaining as rival gamer flicks like Wargames and The Last Starfighter or plot driven science fiction such as Back to the Future and Blade Runner . 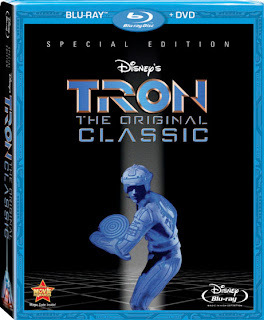 This being said, Tron’s impressively crisp Blu-ray restoration and transfer does wonders to distract us from just how inevitably dated it is given the emphasis on disco era backlit animation and ‘80s geometric shapes, making some of the sequences feel as though the actors have been superimposed on screen savers from PCs of the past. And luckily thanks to a high definition audio track, Clockwork Orange and Shining composer Wendy Carlos’s Tron score sounds better than ever. Yet aside from the potential film buff amusement to be had playing “Spot the Influences: Past and Present” by deciphering the motion pictures from which Tron drew inspiration (2001 , Wizard of Oz , Alice in Wonderland , Fantasia ) and the ones it inspired (Matrix , Inception , Speed Racer ), there’s very little to endear Tron to the hearts of new viewers and tragically, the 2010 sequel doesn’t fare much better. 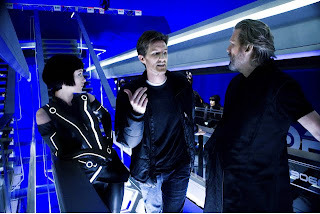 Oddly enough, even though Bridges’ charisma helped keep the energy level high in the original film, his strange evolution from childlike gamer whiz kid to Zen Buddhist Hippie Lebowski Dude in Tron: Legacy – complete with dropping an extra “man” into sentences here and there – calls more attention to the actor rather than the character. And while I’ve always thought that the constant critical comparison between Bridges’s “Dude” and whatever character he’s played since Lebowski has become something of a pop culture cliché, in this case, he truly seems to be channeling the role as though he’s parodying himself the way that De Niro, Pacino, Cage and Nicholson have done when the material is beneath them. While technology has obviously come a long way since the original work’s stunning debut of what in all actuality was approximately twenty minutes of CG animation, Tron: Legacy refreshingly resists the urge to overwhelm the narrative with technical wizardry… at least for the first twenty minutes until once again, everything falls apart. Furthermore because Legacy initially gives off the impression that it wants to elevate the franchise by marrying the technical legacy of the first title with a more cinematic approach thanks to the fact that Legacy boasts a brilliant premise that greatly surpasses the plot of its predecessor, the decline in the film’s quality is that much more disappointing. For audiences, few feelings are worse than experiencing wasted potential and this is precisely what happens in Legacy after we're set up with an emotionally gripping hook as Kevin’s orphaned son Sam (Garrett Hedlund) receives a signal from his father more than two decades after he’d mysteriously vanished without a trace. 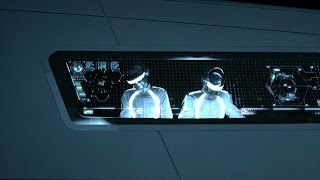 While predictably the digital breadcrumbs left by Kevin lead Sam into “the grid” aka the computer realm of the previous film, instead of offering us an emotionally satisfying payoff to make the journey worthwhile as father and son are reunited, Tron: Legacy quickly explains everything away so that we can just lose ourselves in the CG eye-candy. Likewise, as hard as it is not to be aware of the importance of the computer in the creation of this computer influenced franchise, Disney makes sure you’ll never take it for granted by enhancing the experience of their breathtaking Blu-ray transfer with the added distraction of “Second Screen” technology, enabling you to go deeper inside “the grid” through a synched up second device. Though admittedly it doesn’t make the film any better, allow you to “reprogram” Legacy or at the very least rewrite the screenplay, it does help the time pass by faster, since this one adds an additional half hour to the running time of the original, which already felt much longer than its 96 minute length.